In line with the government’s policy to promote ICT-based education, much effort is being exerted to introduce ICT in schools. The learning environment has changed significantly and we anticipate the demand for educational software, such as digital learning tools, will continue to increase. Accordingly, Yamaha has been developing a music education solution, Smart Education System (SES) which utilizes ICT. We propose a new solution for the field of education which primarily focuses on sound and music. ICT-based advanced technologies instill both teachers and learners with a sense of excitement, and contain elements that enrich education. As such, ICT is expected to have a positive impact on children insofar as cultivating creative and cognitive processes and developing proactive learning for finding/solving problems. The Japanese government announced a new education policy as a part of its Japan Revitalization Strategy 2016, which was approved in a cabinet meeting in June 2016. This policy calls for obtainment of devices for each child as well as the establishment of classes leveraging ICT by 2020. 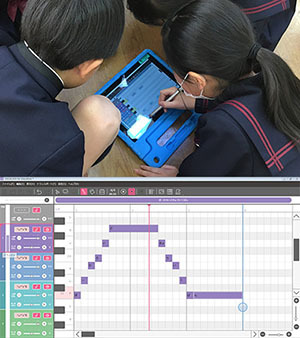 Since 2014, Yamaha has been devising its own original ICT music educational solutions effective in learning environments. We held demonstrative classes at 20 Japanese elementary/junior high schools based on our accumulated know-how and technologies. We developed SES to solve concerns teachers have through discussion. Following this, in February 2017, we began providing SES as a new business, and released digital music learning tools such as VOCALOID for Education, Guitar Class and Koto (a traditional Japanese musical instrument) Class as our initial products. VOCALOID for Education is a learning tool optimized by VOCALOID™, Yamaha’s singing synthesis software, for use in music classes at schools. With this tool, children can input any lyrics or melody that come to their minds into devices such as PCs or tablets and then enjoy creating music, with consideration to notes, rhythm and harmony. As music creation develops both creativity and logical thinking, we believe that our solution would educate children with effective skills for “computational thinking education” which is scheduled to be implemented as compulsory classes at elementary schools in 2020. Therefore, Yamaha will continue to holding demonstrative lessons. 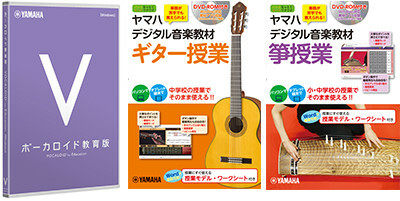 Guitar Class and Koto Class are the learning tools for instrument learning based on video and various lessons. Rich instruction and sample play videos by specialists are included, and students can learn to play by visually confirming key points using functions to adjust playback tempo or angle. One of the features of VOCALOID for Education is the visualization of melodies on screen. Users can try various melodies by intuitive operation to create music and learn about scale and score through this process. This task stimulates children’s curiosity and encourages self-initiative, in other words, encourages active learning. It is an optimum platform for collaborative learning among children as well. By repeating demonstrative classes, we discovered that even children who are not so good at music could still learn and gain understanding, easily by arranging notes at will, and that children are motivated once they gain an understanding of this. Yamaha provides comprehensive solutions including more musical instruments and network equipment, and would like to support new forms of music education based on the innate power of music and active learning. In December 2016, a project to create grade songs was launched at Iinoya Elementary School in Hamamatsu city. This was triggered by 5th grade students. The students found a newspaper article about another school that created a song for their class using VOCALOID for Education, and asked their teacher saying, “We want to do it too.” The students’ inspiration madethe teachers decide to start trial lessons. Students learned the basics of music creation through “VOCALOID for Education,” and were challenged to create an original song for 5 months. The children sang the song for their teachers at the end-of-school-year closing ceremony in March as a gesture of their appreciation. We value our students’ self-initiative. In this case, we thought the students’ request to create a song by themselves was a good opportunity for them to mature, so we decided to provide the challenge. Digital learning tools have technologies that cannot be taught using a stick of chalk and a blackboard. On the other hand, we have something that we want to teach in our own words on a meaningful level. By combining the benefits of these two methods, we wish to continue developing lessons which students can learn while enjoying the classes. Creating music is the ideal opportunity for children to learn about important social matters such as communication with their peers. In music lessons also, they grasp a sense of the chord and structure of music naturally through music creation, and I believe this project produced a great achievement that cannot be obtained through textbooks. Also, creating a song by using VOCALOID for Education was so simple that students not naturally adept at music could participate too. The song was created by everyone, so they have a very strong sense of the song as “our song.” I hope they will continue to sing and treasure this song. The curriculum guideline specified by MEXT requires for one or more Japanese musical instruments in the three years of secondary school so that students may experience the good points of Japanese traditional music culture. Koto Class is a digital learning tool focusing on “koto,” one of the Japanese musical instruments most used in classrooms. When we started development of musical instrument learning tools, we pursued the learning affect and workload reduction of teachers as well. The accompanying “Lesson model pack” provides teachers, with a way of conducting lessons and considering teaching based on the curriculum guideline. 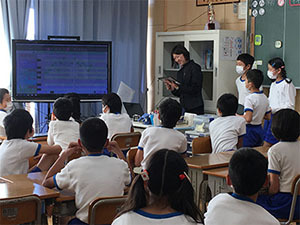 Basic knowledge required for performing can be learned via video, so teachers teaching koto for the first time can give lessons without problem. In this way, streamlining of fulfilling lessons using ICT allows teachers more time for one-on-one lessons or student care instead of lesson preparation. Yamaha will support fulfillment of school education multilaterally through the development of such learning tools. To convey Japanese traditional music culture and aesthetics to students, I chose the koto. Yamaha Koto Class instructs with videos as well as illustrations. Students can learn using their visual and auditory senses, therefore their skills can be effectively improved. In addition, even a teacher who cannot play koto can give lessons. This is a huge advantage. The process of listening to sample play, practicing, solving any issues that arise and polishing their skill is very effective, not to mention useful for teachers to improve their skill.